Grilled asparagus and smoked salmon, served on a hash stack with poached eggs and dill hollandaise. 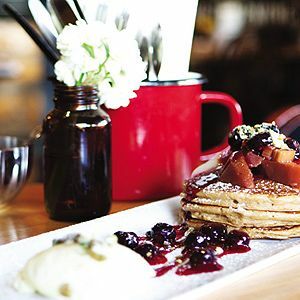 Nestled in an old world collection of buildings on Union Street in Brunswick, Miss Marmalade café radiates a homely vibe that has passersby stopping in underneath the corrugated roof for an impromptu coffee. Blossoming on the outside, timber planter boxes overflow with dainty flowers to border an alfresco dining area, while inside emanates a rustic feel with exposed red brick walls and cosy booth seating, tucked into window corners. Peruse a mouth-watering selection of handmade cakes and sweets before they all disappear and find a satisfying dish to devour before a big day. Scoff down a serve of bacon and eggs benny, with crusty potato and rosemary bread and housemade hash brown, or drop by later for leisurely lunching over baked wild mushrooms with ricotta, spinach and sun-dried tomatoes. Looking for a venue for a work function, a catch up with friends, or to celebrate a special occasion? Miss Marmalade can cater to your needs. We take reservations for tables, or we have a number of rooms which can be booked for larger gatherings such as birthday parties etc. Food can be ordered off our menu or we can provide a range of platters for larger functions. To book, or for more information call us on (03) 9388 8202. We have some delicious and creative new specials for you to try out, such as fig bruschetta, tarragon waffles and potato gnocchi! Call us on (03) 9388 8202.